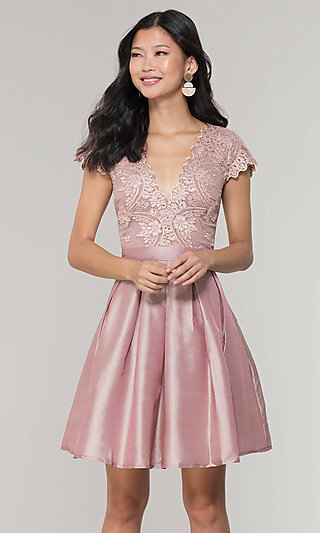 Whether you are looking for a cute short hoco dress, a semi-formal homecoming party dress or even a formal homecoming gown, you will find it in this collection of homecoming dresses. There are homecoming dresses by your favorite designers including Sherri Hill, Faviana, La Femme, Jovani, and many others. These dresses for homecoming are available in many colors, lengths, and styles. Rock the season's hottest looks in a burgundy homecoming dress or choose a daring floral print dress or classic little black dress. Whether you'd prefer a short sleeveless dress or an off-the-shoulder dress, you can find just the homecoming dress you're looking for here. What Style Homecoming Dress Should I Wear? Homecoming dress styles are versatile and varied. 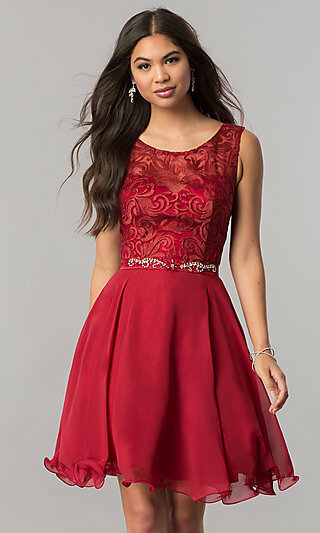 Since most homecoming dresses can double as semi-formal party dresses, your homecoming dress can expand your wardrobe. The dress style you choose for homecoming will be just right to wear for homecoming parties, or later at semi-formal family functions. Looking for a short homecoming dress to showcase your delicate feminine silhouette? Try a soft chiffon dress with a flowing girly skirt, a short fit-and-flare dress, or one of the many strapless homecoming dresses for the ultimate fun and flirty look. Adorned with illusion lace, embroidered accents, and intricately beaded bodices, the stunning embellishments and details of these homecoming dresses portray just the right amount of romantic style. If you're a bit more daring, there are many short hoco dresses as well. Two-piece homecoming dresses, dresses with cut-outs, and strapless homecoming dresses are a great way to turn heads at your next special occasion. Try a floral print dress for a dramatic unique look or a fit-and-flare dress to accentuate your curves. One-shoulder homecoming dresses are a classic and stylish. Whatever your desired style, make your next special occasion a night to remember in one of these beautiful homecoming dresses from PromGirl.